The Jedi autocompletion library analyses your python code and all the files you import to give you the best suggestions possible. Unfortunally, due to the dynamics of the python programming language this does not work in all cases. This will collect all the words that are in the current text block and allows you to rewrite eg. names you previously wrote faster and with less spelling mistakes. Whenever you want to call a blender operator using bpy.ops. this completion provider helps you and saves time because you don’t have to look up the correct parameter names online in the api. 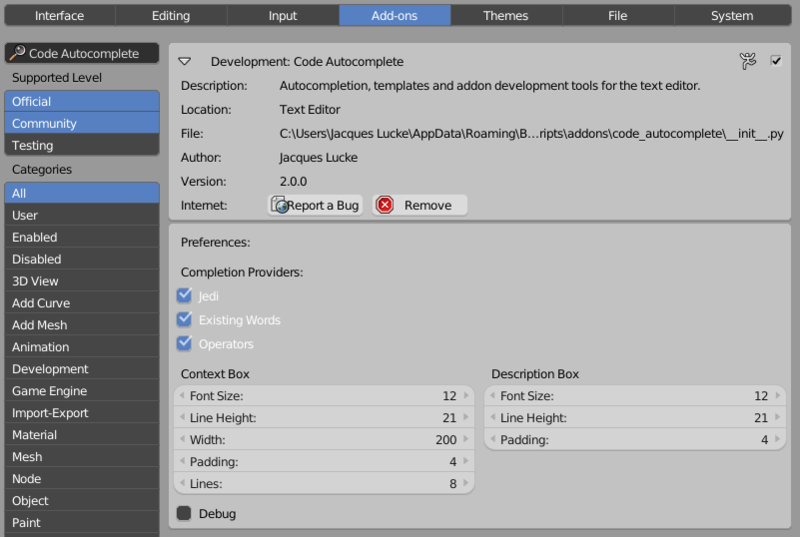 Beside these providers you get multiple properties to change the appearance of the context and description box in the text editor. The settings should be pretty self explanatory. The Debug property is only for me if I want to activate some additional print statements in the addon which help me to track down bugs.